In this context, Phạm Thế Mỹ is the closest there is to a communist presence on this list. Of all composers I picked for this compilation, this native of the south-central province of Bình Định was the only one to have joined the Việt Minh during the French War and, supposedly, stayed communist as an underground member. It was a charge disputed by some of his friends, such as the poet Luân Hoán who argues that Mỹ was first and foremost a devout and patriotic Buddhist. For sure, his opposition to U.S. intervention and the Saigon government put him in jail for a time in the mid-1960s. Whichever conclusion one draws, it is apparent that Mỹ was an actively involved Buddhist. After the French War, he studied at the National Institute of Music in Saigon and taught at several high schools, including Buddhist ones, plus the Buddhist college Vạn Hạnh where he became a department chair. After 1975, he contributed at least several songs to postwar “red music”: further evidence taken by his detractors that he was a supporter of the communist revolutionary cause. Whichever the case in regard to his politics, Phạm Thế Mỹ’s reputation as a songwriter has stood the time with at least three songs, one on mothers and two on old friends. They were very popular in South Vietnam and has remained popular long after the war. The first is Bông Hồng Cài Áo (A Shirt-Worn Rose), which Mỹ wrote with lyrics from Thích Nhật Hạnh, the famous Buddhist monk. It rivals Lòng Mẹ (Maternal Love) by the northern emigré Y Vân as the greatest – or, at least, the best known – twentieth-century Vietnamese song about mothers. The second song is Trăng Tàn Trên Hè Phố (Fading Moon On the City Street), in which the narrator runs into an old friend from school days, now a soldier briefly back to the city. They sit in a coffee shop and catch up until late in the evening before bidding goodbye. More sadly, the third tune, Những Ngày Xưa Thân Ái (Those Cherished Days) hears the narrator recalling times spent with a friend in their youthful years. This friend later became a soldier and eventually was killed during warfare. It is not clear whether the war was the French War of 1947-1954 or the subsequent Second Indochina War, and Mỹ’s detractors argue that he was writing about the Việt Minh. No matter, this song speaks so well of the Vietnamese experience that, like Trăng Tàn, it was recorded by many vocalists in South Vietnam and abroad later, sometimes together in live performances or recordings such as this one from Băng Tâm and Đặng Thế Luân. It is possible that on the basis of these songs and others, Mỹ’s association with the NLF and the postwar regime was not questioned as much by anticommunist Vietnamese in the diaspora. 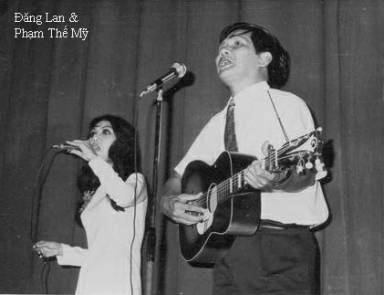 As reported by Luân Hoán in another recollection, a group of Mỹ’s friends and admirers in Houston organized a special night to celebrate his music in 2006, or three years before his death in Vietnam. It is a case where artistry stands above and over ideology. Classics that Trăng Tàn Trên Hè Phố and Những Ngày Xưa Thân Ái are, I nonetheless decided against them when considering Phạm Thế Mỹ for this compilation. I chose instead the less famous Đưa Em Về Quê Hương – Take You To the Country. I find it more coherent to the collective whole. Besides, it wasn’t unknown or little known, only lesser known than some of its author’s output. There were at least two recordings in Republican Saigon, including one by Duy Khánh. It is quite interesting in arrangements, featuring a bluesy instrumental introduction, a brass-dominated accompaniment, and one of the vocalist’s most underrated performances. Years later in the U.S., Duy Khánh recorded another version that is much more conventional and less interesting than this original one. * A similar recording by Duy Khánh is Tâm Sự Người Hát Nhạc Quê Hương – Confidences of One Who Sings the Music of This Country. A less-known and underrated composition by the famous trio Trịnh Lâm Ngân, it doesn’t make my list but comes close. By far, however, the better-known version comes from Miên Đức Thắng, one of the minor recording singers in Republican Saigon. Thắng emerged from the student movement on the left, which was anti-government and anti-American. A former student of Phạm Thế Mỹ, he helped to produce two albums that feature many of Mỹ’s songs. Đưa Em Về Quê Hương is the opening number of the first album. It begins at 1:13 after a short introduction to the album. The structure of Đưa Em Về Quê Hương is slightly unusual for starting with two verses and ending with a refrain without a typical third verse after. In the recording, Miên Đức Thắng sings the refrain twice in a row and that is how the song ends. Hàng cây xanh tóc rủ ven đường. Tuổi thơ anh yêu dấu đâu em? Nay còn đâu, nay còn đâu? Mơ một bát cơm đầy. Bên dòng suối hay ven đồi. Nhớ chi em, buồn chi em. And the old tranquil street with your sweet figure. Dreaming of a full bowl of rice. Why these memories, why these sorrows! Nói chi thêm buồn thôi em. Like sadness rocking the little neighborhood and the soul. Nothing is left, nothing is left! straying bullets that pierce the human heart. Yet here remain young children and their parched lips. For speaking brings forth sadness only. Và quê hương khốn khổ nhiều rồi. Chim ngủ trên tay em. And our country has suffered so much misery. And birds sleep on your arms. In comparison to songs #9 and #10, this song also has a lot about warfare in cities, sometimes with similar images of suffering such as the forlorn children. But it differs from them in ending with several images of hope – and hope is absent in both Tám Nẻo Đường Thành or Quê Hương Chiến Tranh. There are orphans, widows, graves, and bullets in this song as in the previous ones. But there are also smiles, dreams, flowers, and birds. (Doves appeared in countless illustrations of South Vietnamese publications.) Schematically, the refrain serves as resolution to the problem described in the verses. That it is sung twice in a row to end the song underlines this universal experience of longing for hope. There is a good deal on hope from South Vietnamese music, and this tune of Phạm Thế Mỹ is one of the best examples in a song with vivid images of suffering. Phạm Thế Mỹ was a communist – cộng sản nằm vùng – he told me so himself. A few times Phạm Duy’s intervention kept him from being jailed. He wrote some beautiful songs. All right, that settles it. 🙂 I’ve linked your translations to the titles above.